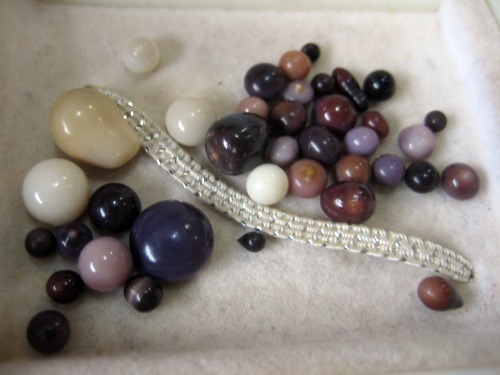 Lifelong quahog pearls collection explodes with purple, lavender and white. Quahog (pronounced “ko hog”) clams are native to eastern United States. Quahogs are clams which many of us have enjoyed in a variety of dishes, or simply steamed at an oyster bar or restaurant. When smaller they're called "Little Neck" clams and "Cherrystone" when larger. They are even available at our local grocery store here in Iowa. We had some for my birthday dinner...yum...but, no pearls. Have you ever found a quahog pearl? Don't let the volume of entries on the link trick you into thinking these pearls are common. 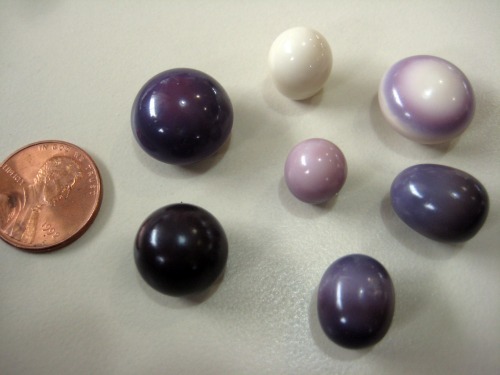 Quahog pearls are not common. 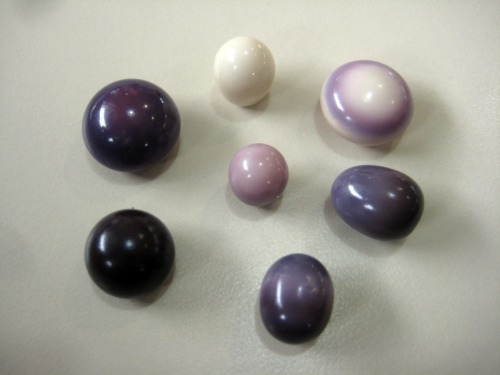 Quahog pearls are among the rarest of natural pearls. Eugene Haas grew up playing with a large white quahog pearl using it along with his brother as a marble, trying to make it hit the hole in the tile floor of their father's seafood shop. Little did Eugene and his brother know they were playing with a rare treasure. 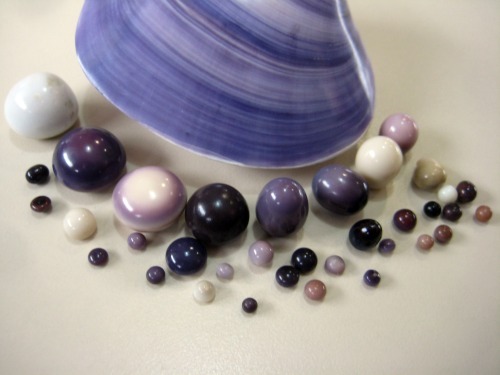 As time went by, Eugene began collecting these fascinating and multicolored pearls they would find as they shucked quahog clams. As Eugene carried on his father's business, he continued to keep a sharp eye out for any pearls, no matter the size, shape or color. 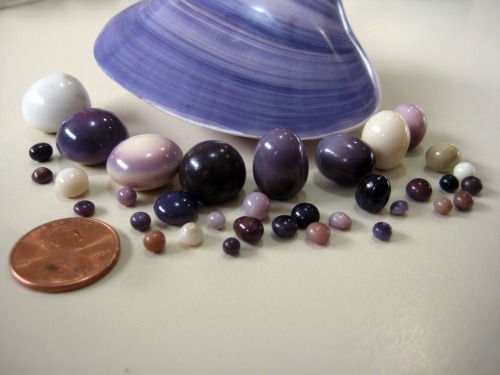 Long before most folks realized quahog pearls' collectability, he saw their rarity and value. 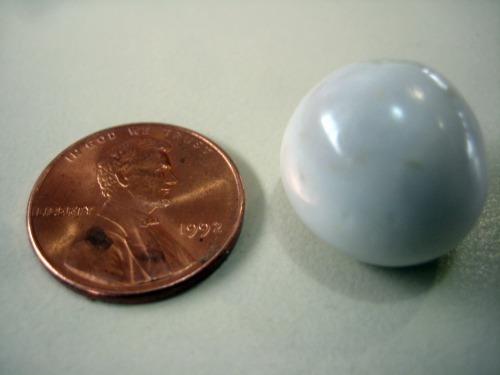 A quahog pearls collection of this size cannot be obtained easily. A couple of these have been purchased as they came to Eugene's attention. The others he carefully squirreled away one by one in a safe place in tiny containers. Eugene showed me his quahog pearl collection not long ago. It is stunning to see so many quahog pearls in a group. 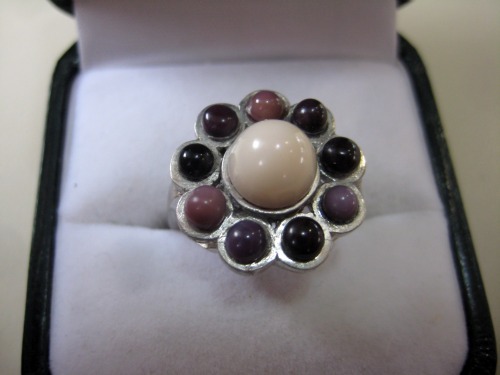 The platinum ring he designed to showcase several of the smaller ones perfectly displays the variety of colors. Eugene recently has made attempts at starting a new Guinness Book of World records category for largest quahog pearl. So far those attempts have failed. I suggested to him we start a contest here to find the largest quahog pearl. Could this be the largest quahog pearl on record? So, do you own a large quahog pearl? Is yours bigger than the white one on this page? You can upload photos and information about it here as well as see many other quahog pearls folks have found. 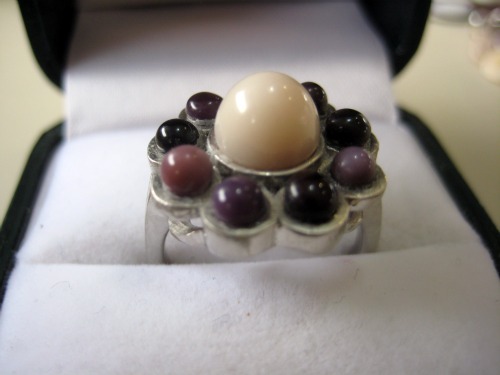 Eugene accidentally discovered that the shell polishes up beautifully as well and has started to make quahog or wampum style shell jewelry. I had the polished quahog shell which I purchased in a Florida shell shop. Isn't it gorgeous? Please let me know if you'd like me to offer these for sale on my site. 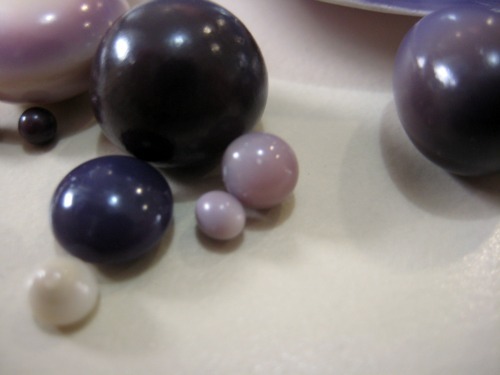 See Eugene's 3 largest quahog pearls here. 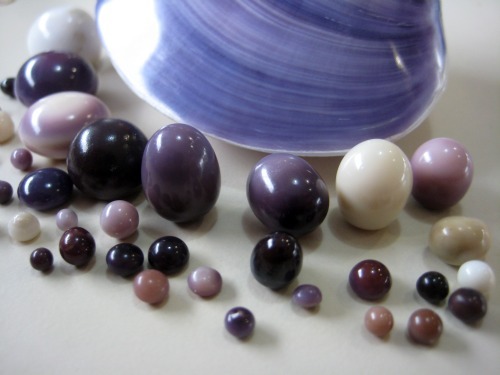 Start your own quahog pearls collection here. Learn about other types of pearls.